Commercial businesses are eyeing the moon. 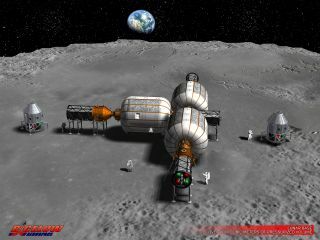 This early concept art shows a lunar operation as envisioned by Bigelow Aerospace. The private firm is intent on leveraging its work on expandable habitats in low Earth orbit for use on the moon. A recent action by the U.S. Federal Aviation Administration is stirring up some moon dust in a legal debate about private companies setting up shop on the moon. In late 2014, the FAA's Office of the Associate Administrator for Commercial Space Transportation (AST) responded favorably to a Bigelow Aerospace's "payload review" request. This query related to commercial development of the moon. Some view the verdict as a necessary step toward creating a legal framework for businesses to set up shop on the moon. But it's also clear more legal conversations are in the offing. The FAA/AST decision also involved other federal agencies, including NASA, the Department of State and the Department of Defense. Bigelow Aerospace was assured that the AST would use its launch-licensing authority, as best it can, to protect private sector assets on the moon. The intent is to provide a safe environment for U.S. firms to conduct peaceful commercial activities on the moon without fear of harmful interference from other AST licensees. "This response is a modest yet important initial step toward creating an environment that will encourage both today's and tomorrow's entrepreneurs to focus their resources on the moon," said Mike Gold, Director of Washington, D.C., operations and business growth for Bigelow Aerospace, LLC. Bigelow Aerospace is keen on deploying, testing and utilizing the firm's expandable habitats in low Earth orbit before landing them on the moon, Gold told Space.com. "Decisions such as the AST's payload review response help to encourage continued investment by Bigelow Aerospace in lunar development, and while a great deal of work remains to be done, we believe that a private sector lunar settlement could be established much more quickly and affordably than most would suspect," Gold said. Bob Richards, co-founder and CEO of Moon Express, Inc. The group is a privately funded commercial space company located at NASA Research Park in Mountain View, California that wants to develop the resources of the moon. Moon Express is in the $30 million Google Lunar X Prize competition. The FAA/AST action creates a number of issues that need addressing, said Michael Listner, the founder and principal of the firm Space Law and Policy Solutions, based in New Hampshire. "Based on what I've read in media reports, it appears that while the FAA has taken steps to support Bigelow's future establishment of lunar modules on the moon, it also recognizes that Title 51, Chapter 509 (Commercial Space Launch Act) — as currently amended — limits their ability to fully endorse those plans through the grant of a launch license," Listner said. First, Congress needs to revisit the Commercial Space Launch Act and amend it so that the FAA has broader authority between the launch and re-entry phase of future commercial activities. The FAA and Congress need to consider how potential laws like the proposed Asteroid Act will affect the Commercial Space Launch Act and specifically how it will affect international treaty obligations. Second, the executive branch, specifically the State Department, will need to work with the FAA and Congress to determine how future commercial activities such as Bigelow's will affect not only international treaty obligations but the geopolitical sphere as well. That second point "is crucial," Listner said, because of blind spots in current regulations. "While the Commercial Space Launch Act currently provides sufficient mechanisms to cover current commercial space activities in regards to international legal obligations," he said, "future activities such as those proposed by Bigelow are not fully covered, and adjustments to the domestic and diplomatic end of the spectrum will need to address that beforehand." This is a slow process, Listner concluded, "and significant changes can't be expected to be made overnight." Bigelow's request, and now the FAA's response, deal with separate issues from the debate over property rights on the moon, said Mark Sundahl, associate dean for administration and associate professor of law at Cleveland State University's Cleveland-Marshall College of Law. "Bigelow never asked for property rights, and it would be contrary to international law to grant such rights," Sundahl said. But the right to use space without suffering interference from other entities is a principle contained in the Outer Space Treaty, he said. The FAA's response just gives clarity to private companies on this issue, Sundahl said, "namely, that the FAA will use its licensing authority to prevent other U.S. licensees from interfering with their operations." Astrobotic Technology, Inc. is pursuing the Google Lunar X Prize and is scheduled to launch its first mission in 2016. Astrobotic is headquartered in Pittsburgh. Astrobotic wants to deliver payloads to the moon for companies, governments, universities, nonprofits and individuals. "I have not heard any concerns regarding the violation of international law. Although some might characterize it as a stretch of the FAA's authority, I believe it is within the agency's scope of authority to only grant licenses with the condition that the licensee not interfere with other licensees," he said. Sundahl said that there is still the issue of the right of companies to extract natural resources and assert ownership over them. "The majority view, in my opinion, is that this is permitted under international law," Sundahl said. "However, there is a minority point of view that could call into question whether the extraction of natural resources violates the ban on the assertion of sovereignty over celestial bodies," he said. Others may say that the benefits of any asteroid mining should be shared with all humankind in accordance with "aspirational" language in the Outer Space Treaty, Sundahl said. "But I doubt this should be interpreted as a requirement that mining companies share profits," he concluded. So how big a deal is this FAA/AST pronouncement? For Matthew Schaefer, director of the Space, Cyber and Telecommunications Law Program at the University of Nebraska College of Law in Lincoln, it is significant, but not a watershed. "This is a very important step by the U.S. government to give increased certainty to private investors in new space activities, that is, activities beyond telecommunications and remote sensing satellite services, such as lunar research facilities or hotels, and asteroid mining," Schaefer said. "To be sure, it is certainly not the final step required, not quite a watershed moment but more than the thin end of the wedge." Schaefer said that the paperwork is a sign of considerable momentum to establishing a more certain investment environment for companies in new space activities. How will foreign countries like China and Russia react to the FAA/AST lunar licensing? "China and Russia may very well react negatively given the competitive issues, but they really have no cause to do so," Schaefer said. "The step taken by FAA/AST to say it will use its launch licensing authority to protect hardware and personnel and ensure safety of operations through zones of noninterference is in full conformity with U.S. international obligations." It is certainly possible that other countries that seek to involve their private sectors in space activities "will look to the U.S. approach as a model to stimulate their own private sector," Schaefer said. If the United States follows up this first step by recognizing private property rights in extracted space resources, Schaefer said, "it will also dampen down any negative diplomatic reactions from most countries by simultaneously creating a 'lite' regulatory or registration regime for such activities." Beyond Bigelow, there are other U.S.organizations working toward commercial lunar activities. Contacted by Space.com, two leading private groups give the FAA/AST go-ahead a thumbs up. "Astrobotic welcomes the recent FAA/AST announcement, which highlights the pressing need for establishment of a legal and policy environment to foster commercial development of the moon and other celestial bodies," responded Dan Hendrickson, director of business development at Astrobotic Technology, Inc. in Pittsburgh. "We will support legislative, regulatory and policy initiatives consistent with international law that allow and encourage the enormous investments required to fulfill the economic promise of this limitless, new opportunity," Hendrickson told Space.com. Similar in view is Moon Express, led by Bob Richards, co-founder and CEO of the group. Moon Express believes that noninterference provisions for its missions to the moon are a "natural extension" of the conventions of the 1967 Outer Space Treaty, Richards told Space.com. The multi-agency clarification received via FAA resulting from the Bigelow Aerospace initiative, Richards said, "is very welcome and reinforcing to the path we are on to explore and develop lunar resources with business and economic principals coming from deep within the American history and culture of private sector entrepreneurship." Leonard David has been reporting on the space industry for more than five decades. He is former director of research for the National Commission on Space and is co-author of Buzz Aldrin's 2013 book "Mission to Mars – My Vision for Space Exploration" published by National Geographic with a new updated paperback version to be released in May. Follow us @Spacedotcom, Facebook and Google+. Original article on Space.com.